Albemarle presents its new 32 Express. What was the newest Carolina Classic family, has now been transformed and updated to become the latest Albemarle model. The 32 Express boasts all top-of-the-line features that serious offshore fishermen demand with serious speed and performance. The Albemarle 32 Express sports a huge seven square meters, flush deck cockpit, while the helm console is spacious enough for latest large-screen electronics. 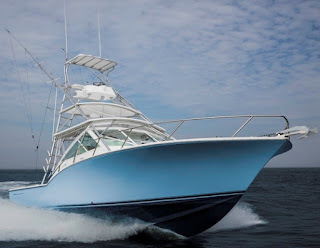 As a serious offshore ten meter fish fighting battle machine the 32 Express sports a full-beam tackle and rigging station, twin fish boxes with optional freezer system available, and optional transom live well. The large helm deck seats six while the salon below features a full galley, a large stand up electric head and shower, double berth and a full size bunk make the interior sleep four persons. The Albemarle 32 Express is powered by standard twin Cummins 480hp, and or optional larger 550hp, or Cats 500hp engines.